Rome is one of my favorite cities in the world and I can't explain it. Crowded streets, graffiti and litter, rude people (okay-not always), and tricky to navigate... but this city stole my heart many years ago. My husband and I made wonderful memories there when we were first married and have had the privilege to go back on a number of occasions. For my 40th birthday, I even went to Rome with a group of girlfriends to run the Roma Marathon! Did I say I LOVE this city? 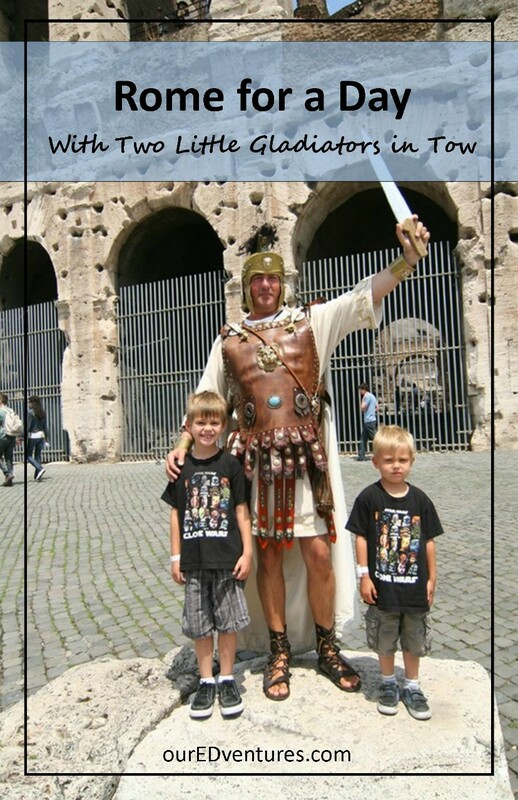 So when we had a chance to visit Rome for one day with our young boys (then 4 and 6), we made plans for all the things we would show them. 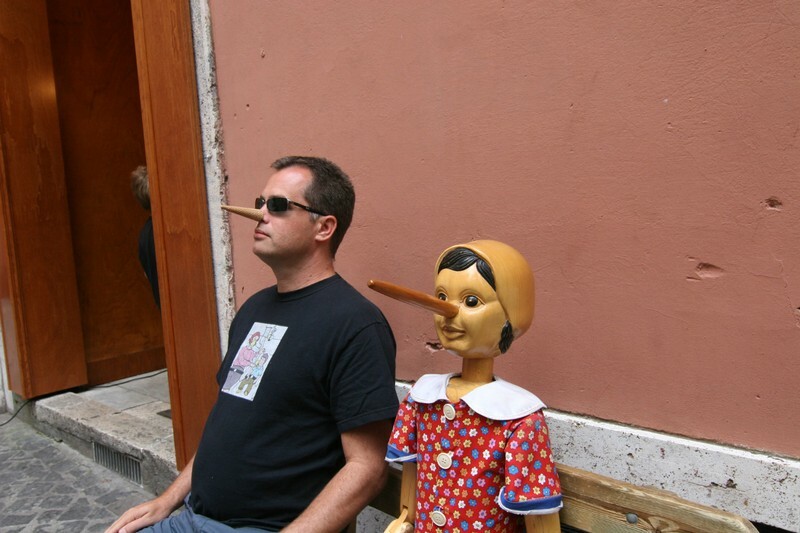 We were aboard a Disney cruise on the Mediterranean and Rome was one of our ports-of-call. In fact, the port is called Civitavecchia, and is about an hour away from Rome by train. We woke early, had a big breakfast aboard the Disney Magic, packed our day-pack and set our for what would be a grand tour of an ancient city - all to take place in about 10 hours. 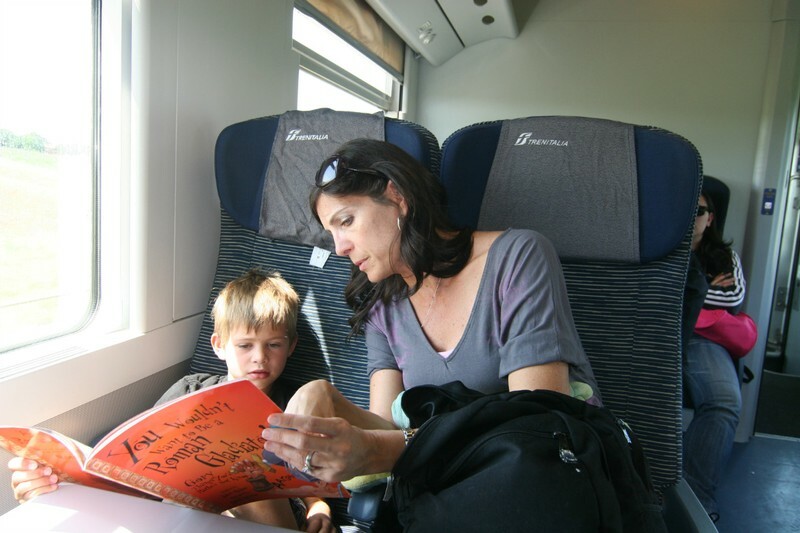 8:30am – We’re off to a good start and already on the train heading to Rome. The train station is about a 10 minute walk from the ship and you can purchase your tickets at the train station. There is no discount for children (as far as we could find) but the fare was not high at 9 Euros per person (much better than the price the cruise ship was charging for a chartered bus). Be sure and validate your train tickets at the machine before boarding the train. This ticket is also good for the Metro in Rome. Once we arrived at Rome’s main train station (Termini) we switched to the Metro Line B to head to the Colosseum. We took it in the direction of “Laurentina” and two stops later, we were there! 9:45am – We arrived at the Colosseum! Coming out of the Metro station and seeing this epic structure right in front of us brought lots of ooooohs and aaaaahs. And not only was Colosseum in all its grandeur before us, but there were also gladiators everywhere (waiting to be photographed for a fee-of course). This was a young boy’s dream! 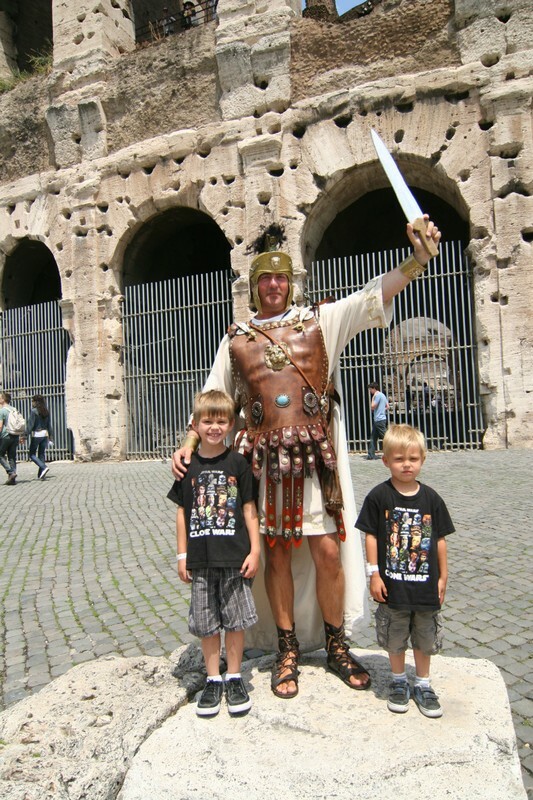 We got our pictures and paid the admission price to go inside and tour the Colosseum. Since we were there in March, we didn’t have to fight large crowds or wait in a long line to get in. We spent about an hour inside. We talked about what is must have been like to be a gladiator fighting a wild beast, or worse yet, a prisoner doomed to die a terrible death. Although the original wooden floor is no longer there, you can see the labyrinth of rooms and corridors that held the beasts and other unfortunate souls. 11:00am – Located right next to the Colosseum is the Roman Forum. Kids will enjoy exploring this city in ruins especially if you have a book that shows what it looked like in its prime. Consider purchasing these travel cards from Tava before your departure and use them throughout your visit. 12:00pm – We were ready for lunch so we took a taxi to Piazza Navona. It wasn’t particularly far away, but you know how it is. When members of your party have reached a “I’m tired and hungry” state of mind, it’s best to meet those needs quickly. 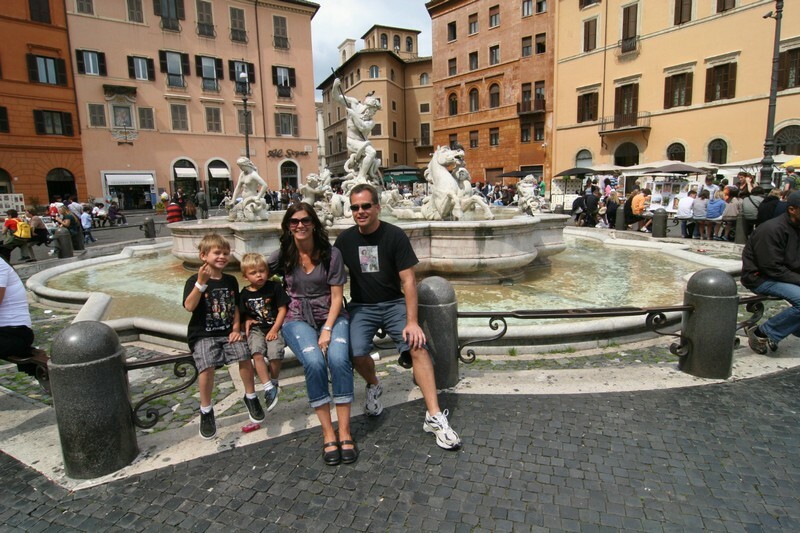 We chose Piazza Navona since it’s a meaningful location for my husband and me. It’s a large oval shaped piazza with plenty of dining options and a couple of interesting fountains in the center. It would also be the perfect spot to begin our walking tour once we were done with lunch. 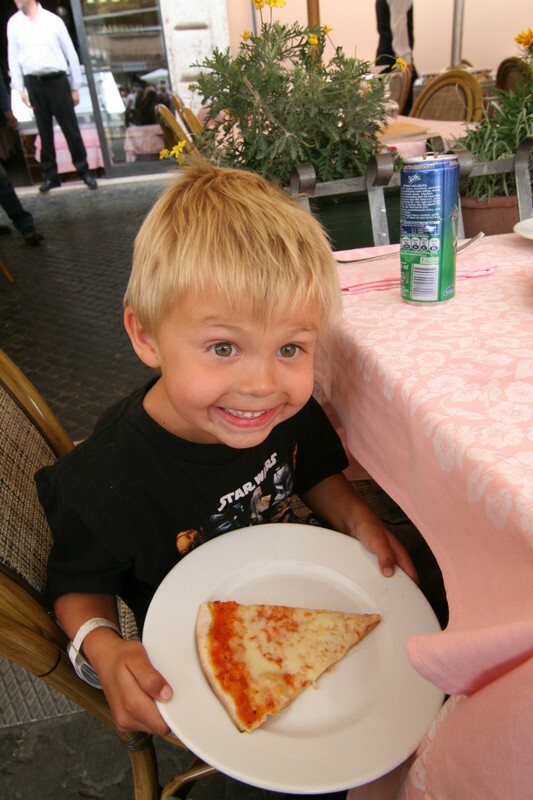 2:00pm – Tummies full of pizza and pasta and ready to head out. We thoroughly enjoyed spending the next three hours wandering through the narrow streets of Rome and enjoying the sites along the way: The Pantheon, The Trevi Fountain, and The Spanish Steps were a few of the highlights. We also enjoyed gelato along the way. 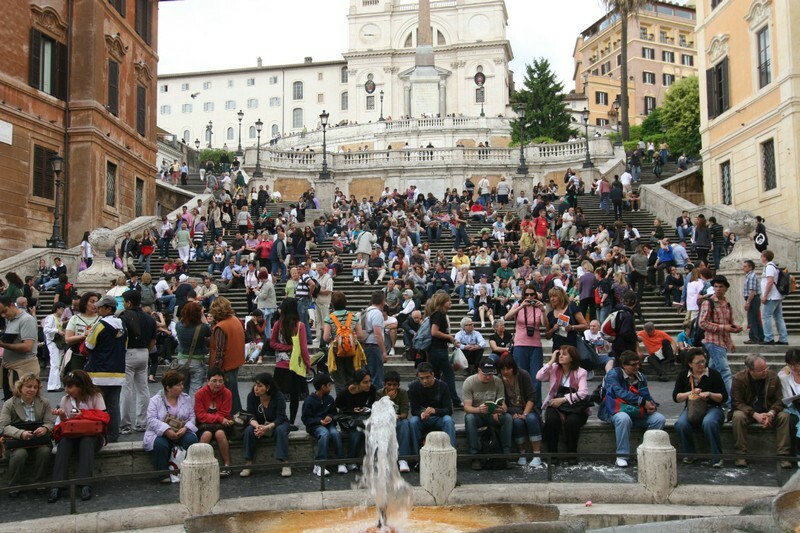 Once at the Spanish Steps my husband and boys sat on the Spanish Steps amidst the many people while I snapped a picture from down below for our very own “Where’s Waldo” picture. Around 5pm we decided it was time to head back. 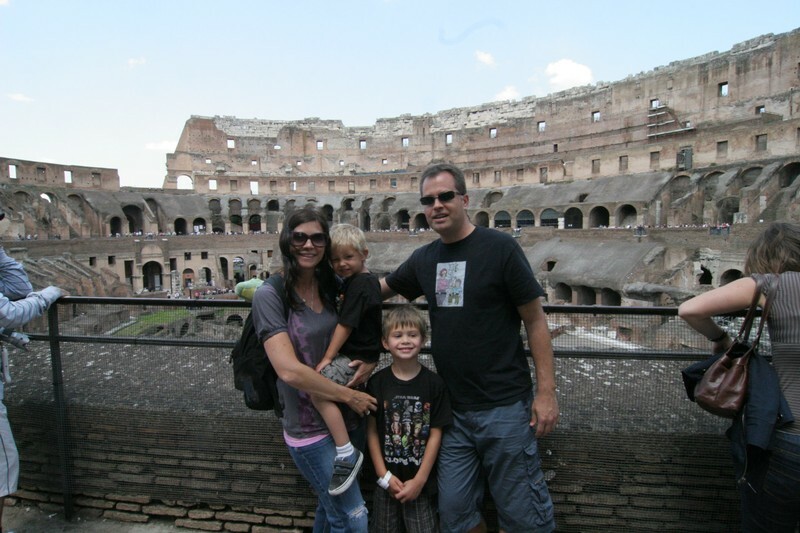 We had given our boys “Rome in a Day” and my husband and I enjoyed being in this favorite spot of ours. Of course, there is so much more we could have done but we were fine with making these wonderful first-time memories with our boys. Can you spot the boys? We found the Metro station at the Spanish Steps (Spagna) and took the Metro line back to Termini where we boarded our hour-long train ride back to Civitavecchia.